From kitchen windows and pantry doors to kitchen cabinets, installing our stained glass infuses Austin kitchens with a sense of rich luxury reminiscent of Old World Europe, but with a more contemporary spin that stylishly decorates kitchens without interfering with their functionality. Choose from styles ranging from traditional floral or Celtic designs to modern and Art Deco influences. 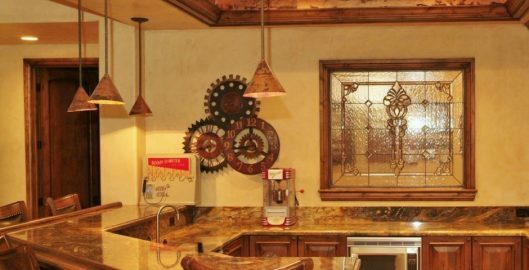 Add stained glass to your Austin kitchen through custom windows, glass paneled pantry doors, and kitchen cabinet doors for a unique touch that will become a talking point with friends, family, and neighbors at your next gathering. 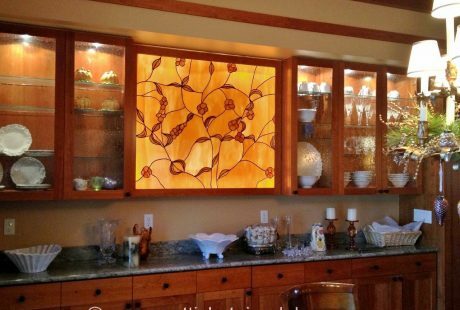 At Stained Glass Austin, we install our premium, handcrafted stained glass onto your current kitchen cabinets or create custom kitchen cabinet doors that will safely hold your new stained glass. We integrate our fine stained glass into your Austin home seamlessly, whether you want your stained glass to match or complement the theme. If you’re remodeling your kitchen, we can work with your cabinet builder to match your cabinets, from lighter colors and textures for transparency to heavier glass more for decoration. Our stained glass is a beautiful addition to any Austin home. For more tips read this article on decorating with stained glass. Call or email Stained Glass Austin today to speak with one of our experts about installing our high-quality stained glass in your Austin home!